Lifetime Learning is excited to announce the book selected for the 10th anniversary of the Washington County READ . . . The Train to Crystal City by Jan Jarboe Russell. The event will be held at Unity Theatre on Thursday, October 18, 2018 at 5:30 pm. The evening is free to the public and will begin with a reception in the lobby, followed by a dramatic reading of the book and a presentation by the author in the theatre. Published in 2015, the book was on the New York Times bestseller list. In 2016, it won the Carr P. Collins Award for Best Book of Nonfiction, given by the Texas Institute of Letters. The Train to Crystal City is the story of FDR’s secret prisoner exchange program and America’s only family internment camp during World War II. The camp was located at the southern tip of Texas, in a small desert town called Crystal City. The trains took Japanese, German, and Italian immigrants and their American-born children there, where some were then exchanged for Americans being held behind enemy lines in Japan and Germany. This is a remarkable story, relevant to today’s discussion of immigration, bias against immigrants and immigration policy. It tells of something that happened in Texas, but is known to very few Texans. This is history that will give us a better understanding of today’s issues. Crystal City survivor, Adolf "Wes" Wesselhoeft, LtCol USAF, Retired, will discuss his remembrances of that era at the Nancy Carol Roberts Memorial Library in Brenham, on Wednesday, October 17, at 2:00 pm. The 2018 READ will be held at Unity Theatre in Brenham on Thursday, October 18, at 5:30 pm. The event is free and the public is welcome. A reception will be held in the lobby, followed by a dramatic reading of the book, and presentation by the author, in the theatre. Jan Jarboe Russell was born in Beaumont, Texas. She graduated from the University of Texas at Austin in 1972 and started her career as a political reporter for The San Antonio Light. In 1976, she worked for the Hearst Bureau in Washington, D.C. She later went to work as a columnist for the San Antonio Express-News. After studying at Harvard for an academic year as a Nieman Fellow, she joined Texas Monthly magazine as a senior editor and remains a contributing editor. In 1999, Scribner’s published her well-received biography of Lady Bird Johnson, named by The Washington Post as one of the best books of the year. She is currently working on a new book about Eleanor Roosevelt. 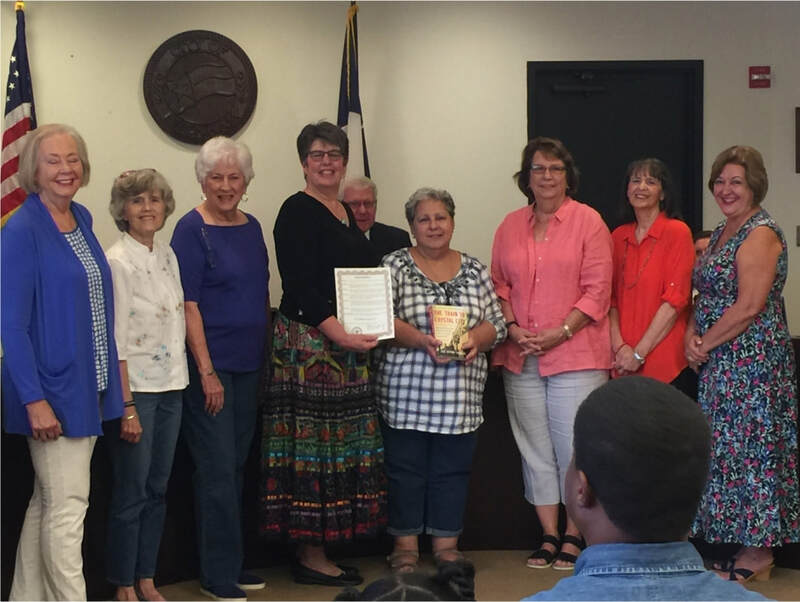 Jan lives in San Antonio with her husband, Dr. Lewis F. Russell, Jr.
Proclamations were issued by local government entities designating September 4th through October 18th as the official period for the 2018 Washington County READ. Lifetime Learning was recognized for its efforts in encouraging reading within the community. Included among those present were Lifetime Learning President, Carol Muegge, and READ co-chairs, Shirley Herring and Michele Smith. 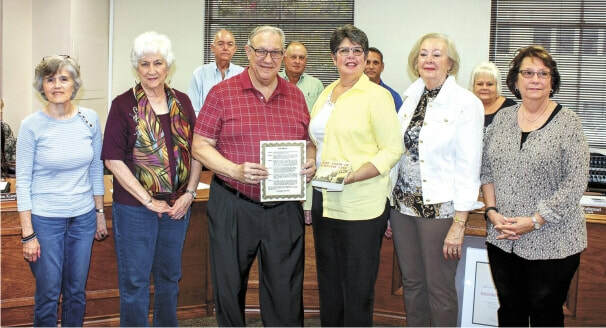 City of Brenham Mayor, Milton Tate (seated), issues city proclamation on September 6, 2018. John Brieden (center left), Washington County Judge, issues a county proclamation on September 4, 2018. This 10th year celebration of promoting community literacy and reading diverse books is a milestone for Lifetime Learning. The community has been so supportive and the hope is that this year will be even better. Book reviews will be done through various organizations. If your organization is interested in scheduling a book review, please call 979.353.1089. ﻿All Lifetime Learning lectures and luncheons are open to the public. Preregistration is required. Sign up to get current program information. We will send you occasional emails with programs for each season and then gentle reminders before each event.